Custom dress socks and athletic socks are both among the most in-demand promotional items a business can choose. Why exactly? There are several reasons. Here’s a look at 7 of the reasons why custom socks could be an ideal choice for your next promotional item of corporate giveaway. Most people don’t realize what a booming business the sock industry represents. The average person buys a dozen pairs of socks or more each year, and the demand for socks is only expected to grow. In fact, the demand for socks is expected to grow 6.7% globally between 2018 and 2025 — which will make socks an estimated $75.1 billion dollar business in six to seven years. When you choose custom socks as your next promotional item, you’re helping to serve a small part of that insatiable demand. Never forget the first rule of corporate promotions and giveaways: You must offer something that prospective customers and recipients actually want. And, believe it or not, people want socks. Think about it this way: There’s nothing worse than getting ready in the morning, getting dressed and then opening up your sock drawer … only to find there are no clean socks that match your outfit. The last thing you want is for your promotional or giveaway item to end up in the trashcan. That’s not going to happen when you opt for custom printed socks. People love socks, and your business is in a unique and attractive position to provide them. Believe it or not, fun socks are trendy right now. Canadian Prime Minister Justin Trudeau has been snapped wearing rubber ducky and Star Wars-themed socks. Prince Harry of the United Kingdom has been caught wearing dress socks with neon-colored stripes. Justin Bieber has worn pink-striped dress socks at appearances. And it’s not just men: Jessica Alba has been photographed trying on shoes while wearing pink-and-blue patterned socks. We’re a long way from the days when you wore plain dress socks that matched the color of your pants (to make you look taller) or the color of your shoes in some cases. Today, people are using their socks as an opportunity to express their personalities and to add a little pizzazz to otherwise formal outfits. Even the late George W. Bush who was known to be a little stiff as president of the United States took to wearing fun dress socks in his later years. All of that to say: When you create fun custom dress socks as part of a promotion or giveaway, you’re creating something that is very much trendy and desirable right now. The Wall Street Journal even wrote an article about the skyrocketing price of fun socks (more than $200 in some cases). There’s demand for fun custom design socks out there, and you have a huge opportunity to help fill that demand. There’s a wonderful sensation that comes with slipping on a new pair of comfortable, quality socks. But just the opposite can be true, too. If you try on a pair of socks that offer little comfort and inferior quality, you know the minute you put them on, too. So, if you’re going to opt for custom logo socks as part of a promotion or giveaway, make sure they are both comfortable and high quality. Your prospective customers and recipients will know the minute they try them on whether or not they are worth keeping. And always remember this: The quality of your promotional and giveaway items is a reflection of the quality of your company’s products and services. When you’re looking for custom logo socks to use as promotional or giveaway items, look for socks that are made from high-quality materials and that feature intelligent design that promotes durability. Most companies that handle promotions can provide samples for you to choose from. Take advantage of those samples, and test out custom dress socks for yourself before you make an investment. Which is better: custom dress socks or custom athletics socks? It really depends on your brand and the people you are trying to connect with. If you work for a consulting firm and your clients often have business professional dress codes, go for custom dress socks. If you work for a clothing retailer and you sell outdoors and recreational gear, opt for custom athletic socks. If you can’t decide which one fits your brand best, consider doing both. As noted below, custom socks offer enough value and are available in small enough quantities that you could order both and give recipients a choice between the two. Remember that quality matters on both fronts. Whether you’re choosing custom dress socks or custom athletics socks, recipients will only keep them and only be impressed by your company if those socks meet high quality standards. You can find promotional and giveaway items that cost well more $100 per unit, and there’s nothing wrong with those high-end items. In fact, in many situations, a promotion or giveaway demands something of high value. But that’s not always the case. Sometimes you need more volume as part of your promotion or giveaway, which means you need an enticing item at a lower per-unit cost. It’s in situations like that where custom socks are fitting. Custom printed socks can be ordered for as little as $4 a pair — and sometimes even lower depending on the quantity and style of sock. That’s not much at all to invest in an item that recipients are likely to keep for the long-term and that bears your logo or branding. When you need real value out of your promotion or giveaway, consider custom design socks before you consider higher priced items. Custom logo socks are a great way to be creative with your brand. This is especially the case if you work in a relatively buttoned-up industry like accounting or engineering. What you do is important, and you do good work, too. But custom printed socks are a way to show that you can have fun. There are also lots of different styles of custom socks that offer different ways to present your logo. You can choose knee-high socks, business crew socks, ankle socks, no-show socks, mid-length socks, quarter-length socks and more. Some of these styles fall into the custom dress socks category, and others are athletic socks. No matter what you choose, you enjoy various options for where and how to present your logo. It’s not always easy to be creative with your branding. Custom printed socks open up new opportunities to be creative in ways that aren’t always available. Shop around for promotional and giveaway items, and you might find some jaw-dropping minimum order requirements. In fact, some providers like to entice corporations with low per-unit prices, only to reveal that those low prices are only available with astronomically high order quantities. That’s not the case at iPromo, where we offer a range of different custom socks with minimum orders of 30. 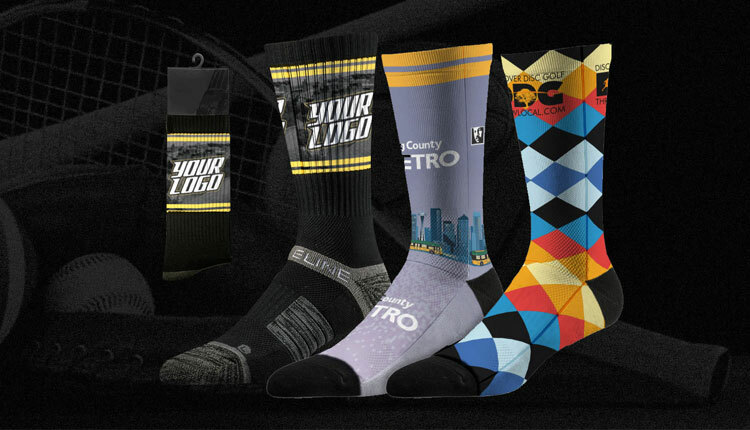 When you’re able to buy in quantities as small as 30, you have far greater flexibility in how you use custom logo socks as part of giveaways or promotions. And that’s a nice thing to have when you’re trying to build a business — the flexibility to see your vision for a promotion or giveaway become a reality. Design: Our custom socks include the on-trend designs that are so popular today and celebrities, politicians and business people. Comfort: We have curated a collection of both custom dress socks and custom athletic socks that meet the highest standards for comfort. Quality: Our products meet high quality standards, too, ensuring that recipients can use your custom socks for years to come. Options: Enjoy options when you browse our selection of custom design socks. You’ll find dress socks, athletic socks and different versions of each. Value: Shop with iPromo and it’s like you’re getting custom socks wholesale. Order in small quantities, pay low prices, and save the more you order. Custom socks are among your safest bets when planning a promotion or giveaway that requires value. There’s little risk when you use custom logo socks, and you’ll be amazed at what a powerful response custom socks generate from your target audience. So what are you waiting for? If and when you’re ready to explore custom sock options, we’re ready and waiting to help. Browse our selection of custom socks today.